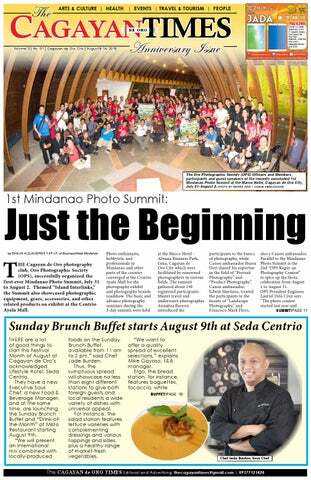 he Cagayan de Oro photography club, Oro Photographic Society (OPS), successfully organized the first ever Mindanao Photo Summit, July 31 to August 2. Themed “Island Interlinks,” the Summit also showcased photographic equipment, gears, accessories, and other related products on exhibit at the Centrio Ayala Mall. foods on the Sunday Brunch Buffet, available from 11 am to 2 pm,” said Chef Jade Burden. Thus, the sumptuous spread will showcase no less than eight different stations to give both foreign guests and local residents a wide variety of dishes with universal appeal. For instance, the salad station features lettuce varieties with complementing dressings and various toppings and sides, plus a healthy range of market-fresh vegetables. on its 3rd year Anniversary! Internet signals using balloons, drones, satellites, and TV waves. Another related project from Facebook is looking at providing free limited mobile Internet service to people in poor countries. Unfortunately, we can’t stop the race in a technical future any more ... ! +++ Email: doringklaus@gmail.com or follow me in Facebook or Twitter or visit www.germanexpatinthephilippines.blogspot. com or www.klausdoringsclassicalmusic. blogspot.com. it’s just a hobby, and some have learned everything by themselves, and some go to a course and learn. They post pictures here in Facebook, send photos to each other, asking how to do this and that, recipes and they learn from each other.” Indeed, Ms. Chaves inherited her artistic chops from her Nanay’s side, Purificacion “Purie” Riego de Dios of Cotabato City whom she first saw baking a chiffon cake and learned how to mix the batter manually in one direction making mostly marble and chiffon cakes on her Northern Hill electric oven. PhP399. As a bonus, the featured drinks come with a free cuddly stuffed toy poodle (“Koko”). It is available the whole day in Misto for the entire month of August. For reservations and further inquiries, please call (088) 323-8888 or +63 917 5775910.
the response from the contestants were enough CAGAYAN DE us OROto MAIN to convince doBRANCH it again P & J Lim Bldg., Tiano Brothers Kalambagohan Sts., this year. Photography is Tel. # (08822) 727-829 * a way to promote our city Telefax # (088) 856-1947 fiesta activities and the city CAMIGUIN BRANCH B. Aranas St., Poblacion, Mambajao, itself. Many still don’t know Camiguin Tel. # (088) 387-0491 the other activities of our CORRALES BRANCH Corrales Ave., Cagayan de Oro City city fiesta. The photo contest DIVISORIA hopefully will BRANCH change that. Atty. Erasmo B. Damasing Bldg., #61 Don A. St., Cagayan de Oro Cityhave MostVelezcity fiestas Tel. 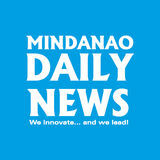 # (088) 857-3631 their own photo contests LAPASAN BRANCH to enhance Lapasan Hi-way, their Cagayan detourism Oro City Tel. # (088) 231-6739 growth. Hope we can sustain CARMEN BRANCH thisVamenta yearly.” Blvd., Cagayan de Oro City Tel. # (088) 231-2011 For more information visit the Oro Photographic Society facebook page. Republic of the Philippines REGIONAL TRIAL COURT OF MISAMIS ORIENTAL 10TH Judicial Region Branch 17 Cagayan de Oro City OFFICE OF THE PROVINCIAL SHERIFF NOTICE OF EXTRA-JUDICIAL SALE FILE NO. 2015-013 Upon extra-judicial petition for sale under Act No. 3135 filed by ROBERT T. CHUN, mortgagee, a resident of Osmena St., Cagayan de Oro City, against SPS. ANTONIO & FELINA REYES, mortgagors, with authorization granted to his heirs SPS. OSCAR & MARIBEL REYES, the other heirs are Mr. EDGAR REYES , MR. ALLAN REYES & ALEX REYES , all residents of Jasaan, Misamis Oriental, to satisfy the mortgage indebtedness which as of February 11, 2014, amounts to SEVENTY FIVE THOUSAND PESOS (P 75,00.00), including interest and expenses, charges, attorney’s fees and expenses of foreclosure, the undersigned or her duly authorized deputy will sell at public auction on August 27, 2015 at 10:00 A.M. or soon thereafter at the Office of the Clerk of Court, Regional Trial Court, Branch 17, Tourism Bldg., City Hall, Cagayan de Oro City to the highest bidder, for cash or manager’s check and in Philippine Currency the following property with all improvements, to wit: TAX DECLARATION NO. 910908 “ A parcel of residential land located at Upper Jasaan, Misamis Oriental, otherwise known as Cad Lot 2732-A, bounded on the North by Lot No. 109 (Lot 446, sketch plan); South by Lot 104 (Lot 2731-B per sketch plan); East by San Francisco St.,; and West by Lot 106 (lot 195, per sketch plan); having an area of 289 sq.m. more or less, and covered by TD No. 910908 for 1992, in the name of mortgagors, together with the buildings thereon constructed covered by TD No. 856590, consisting of a residential house, store bakery/bodega.” All sealed bids must be submitted to the undersigned on the above-stated date, time and place. In the event the public auction should not take place on the said date for whatever reason, the public auction will proceed on the next working day, without further notice, posting and publication. Prospective buyers may investigate for themselves the title herein-above described and encumbrances thereon, if any there be. July 23, 2015, Cagayan de Oro City.